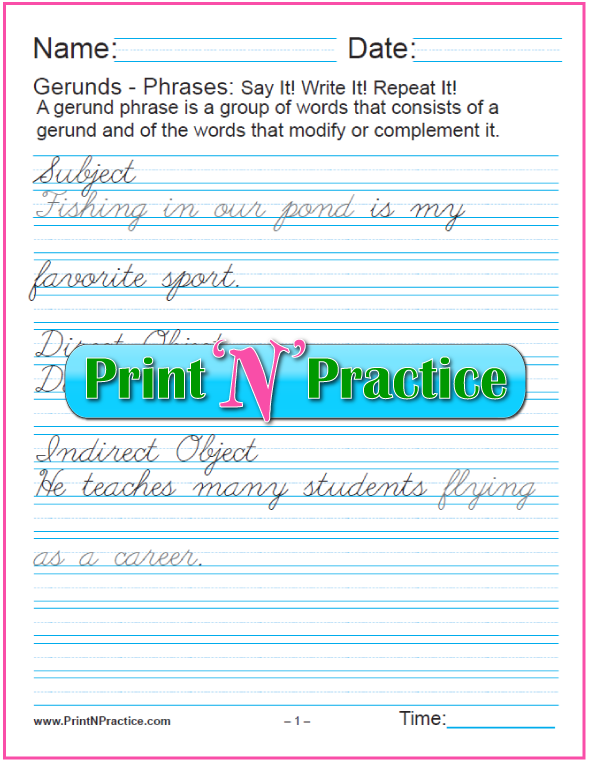 The concepts of the participle, gerund and infinitive can all be taught within a few quick lessons. The main thing is to learn a new way to use a familiar word or phrase. Make it an adventure! 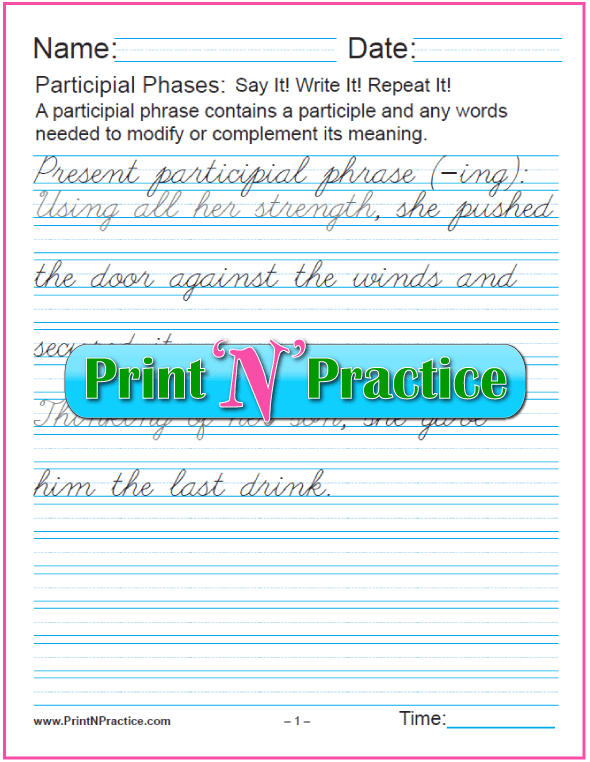 Many English words can each be used as different parts of speech. 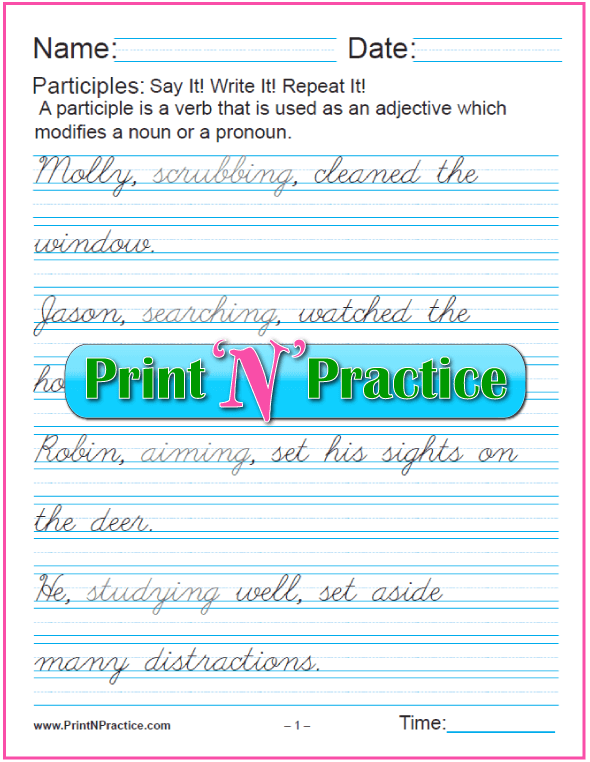 This is part of what is tricky for those new to learning English Grammar. It can be tricky for the rest of us, too. 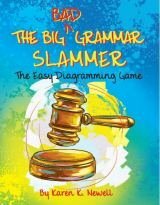 English Grammar teaches the various uses of words that are often the very same words with the same spellings in other uses. It's the function of the word or words in a sentence that determines its label. 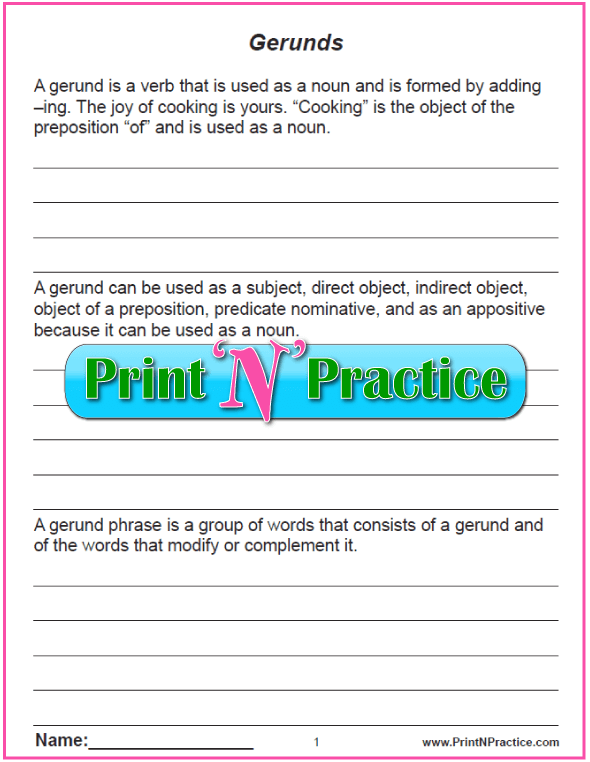 Gerunds - A gerund is a verb that is used as a noun and is formed by adding -ing. The joy of cooking is yours. Cooking is the object of the preposition of and is used like a noun. 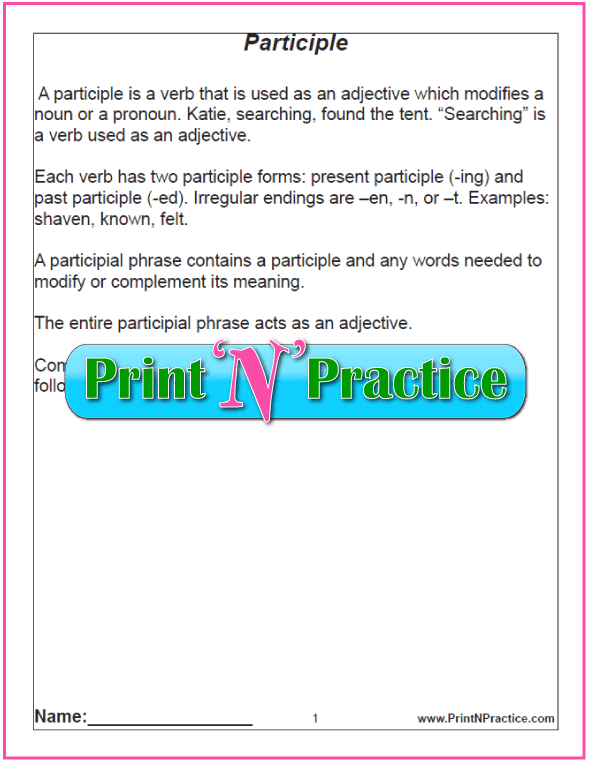 Participles - A participle is a verb that is used as an adjective. Katie, searching, found the tent. Searching is a verb used like an adjective. 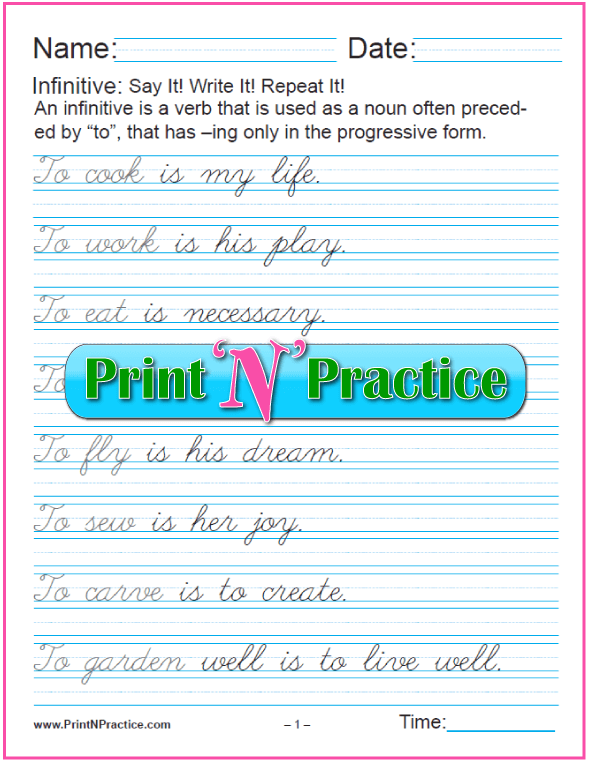 Infinitive Verb Form - An infinitive is a verb that is used as a noun often preceded by to, that has the suffix -ing only in the progressive form. It names an action. It is too warm to skate. 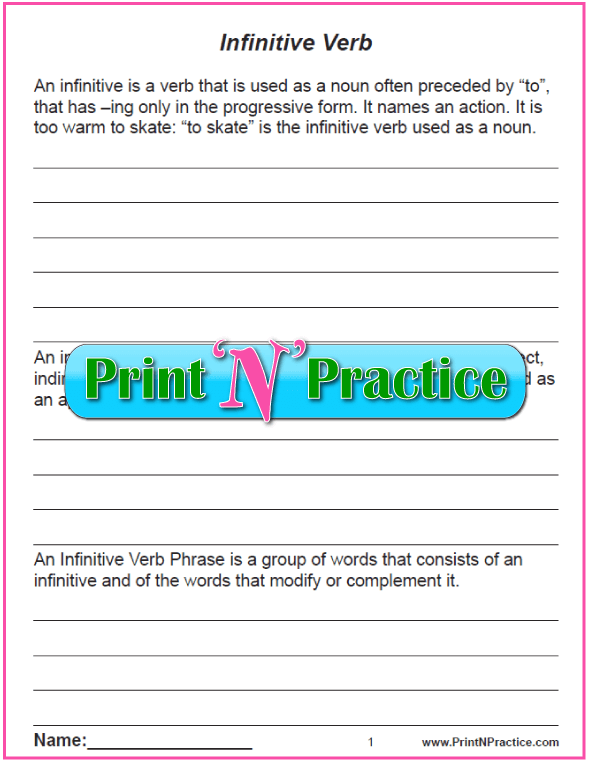 The words to skate form the infinitive verb used like a noun. 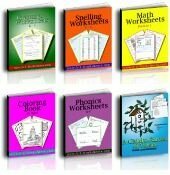 Use our diagram charts and diagramming worksheets to "see" how these terms are used, where they fit in sentences and the difference between a gerund and infinitive. 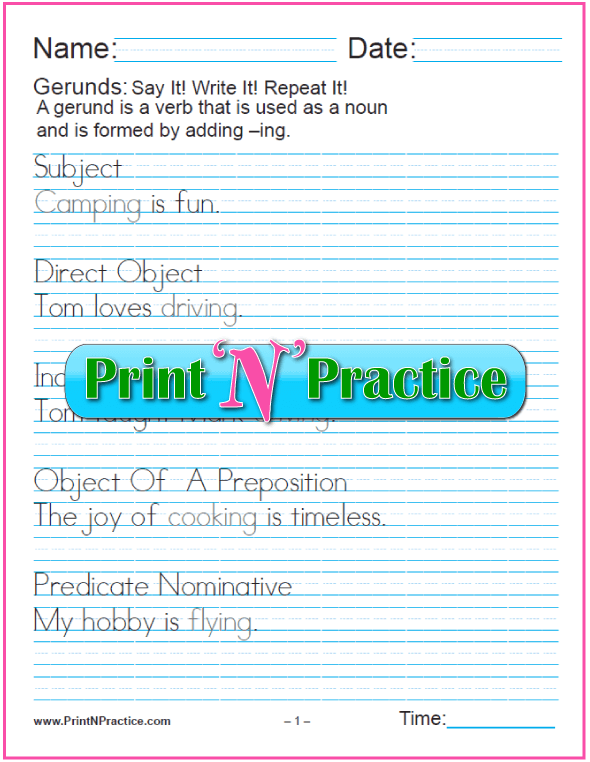 A gerund is a verb that is used as a noun and is formed by adding -ing. 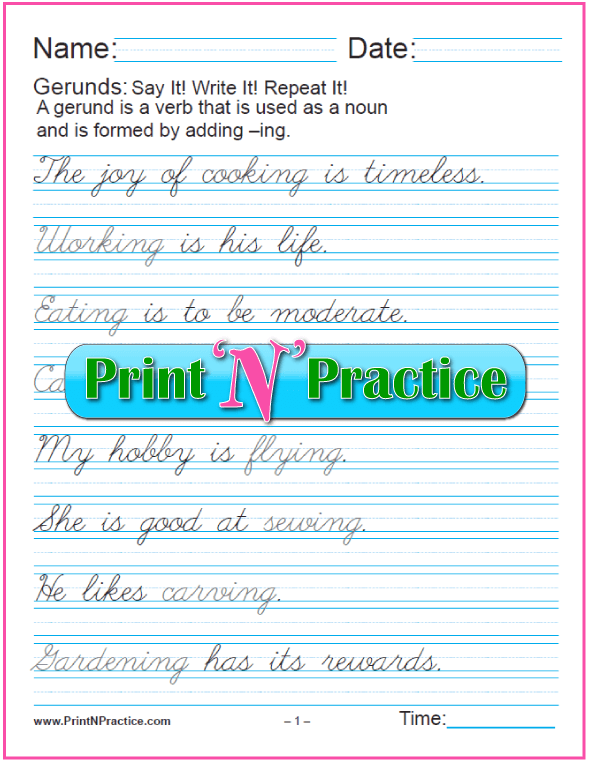 The difference between a gerund and an infinitive is the word structure and how the word is used. Note that the black text turns gray for the examples. 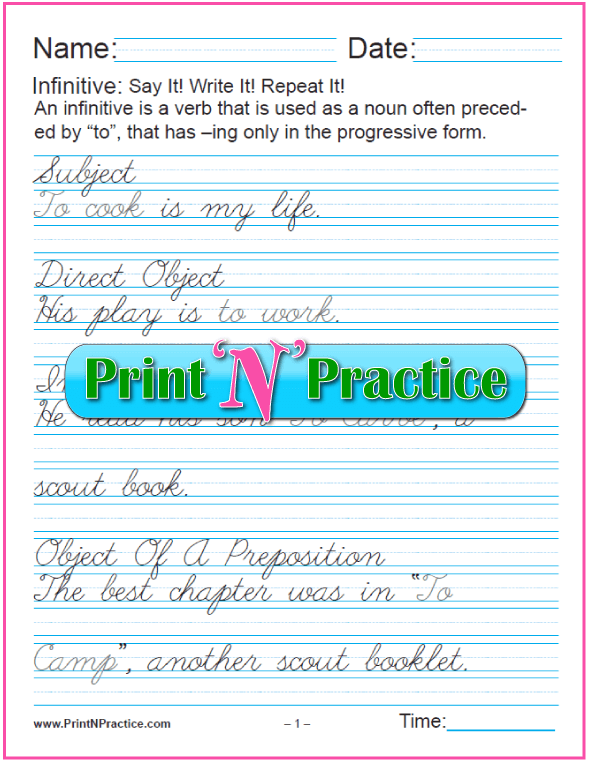 If the infinitive is used, the word structure generally includes the word "to" in front of the verb. See more in section three. 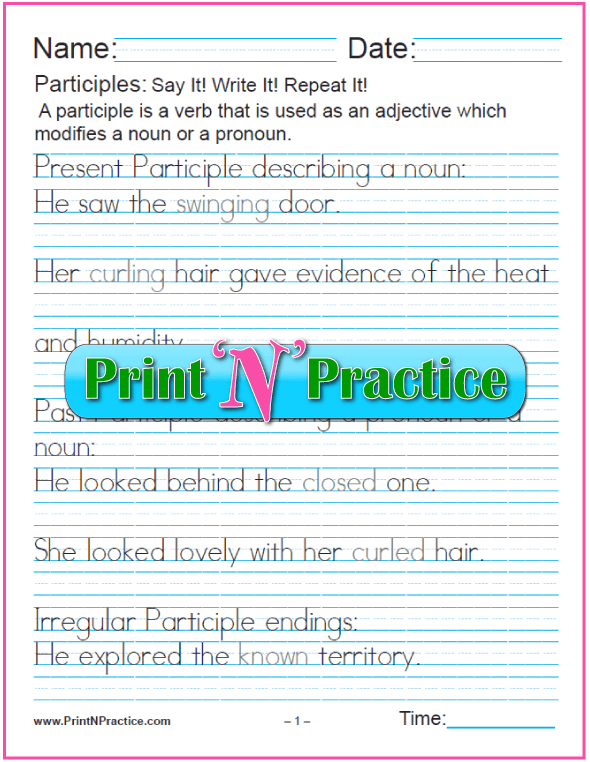 A participle is a verb that is used as an adjective. Searching is a verb used like an adjective. 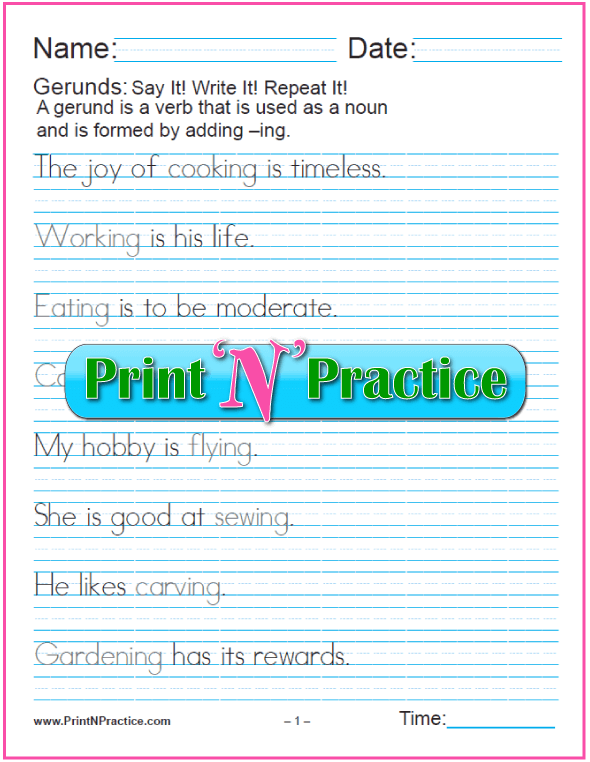 When children are learning about the gerund and infinitive, it's good to teach the participle as they're already looking for different uses of verb forms. 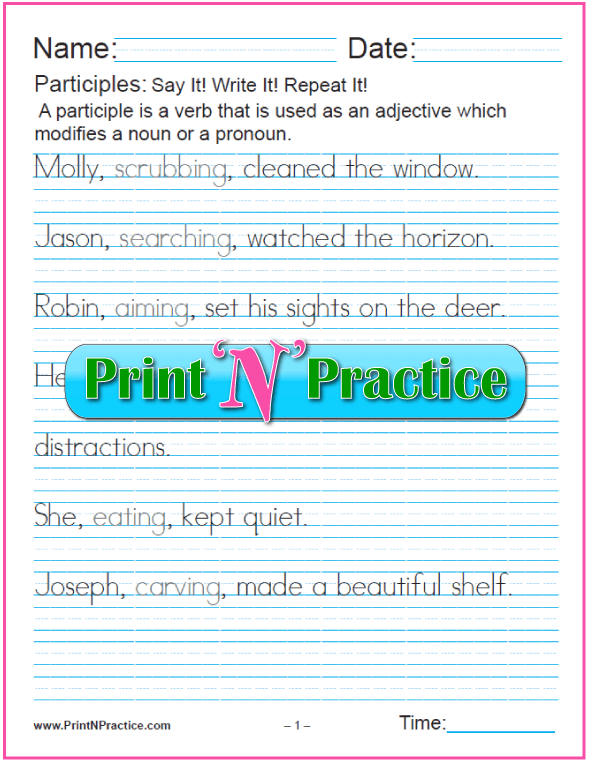 These worksheets offer participle practice so the answers are already included. 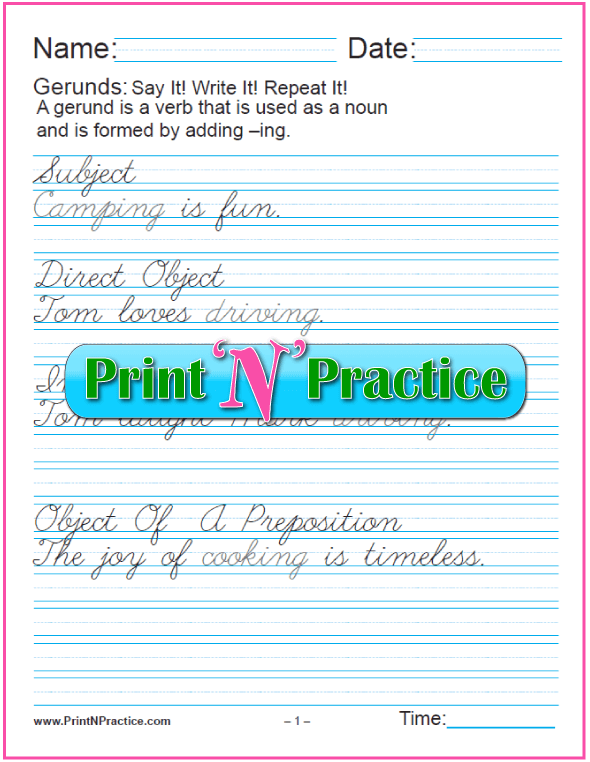 The first set offers copywork of the definition so kids "get to know it" better. 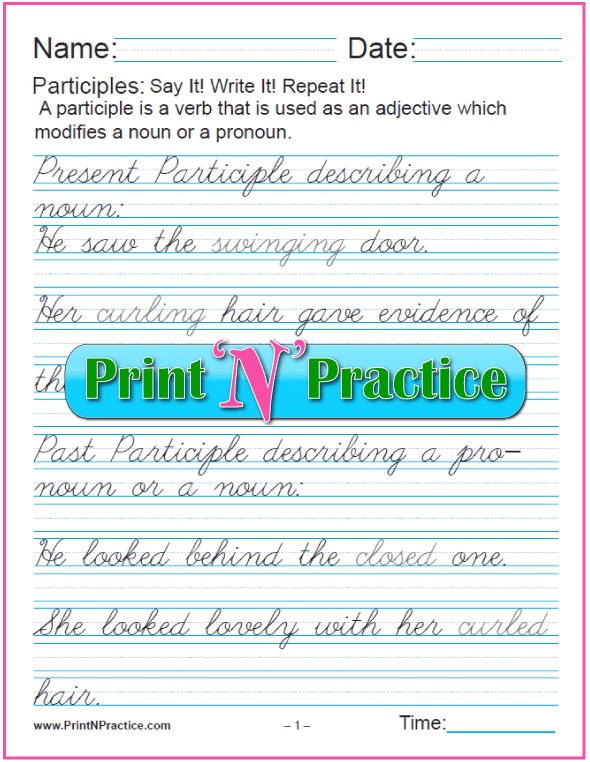 The next sets show participles where the verb is used as an adjective. The next shows irregular endings. And the last show present participial phrases that use -ing. 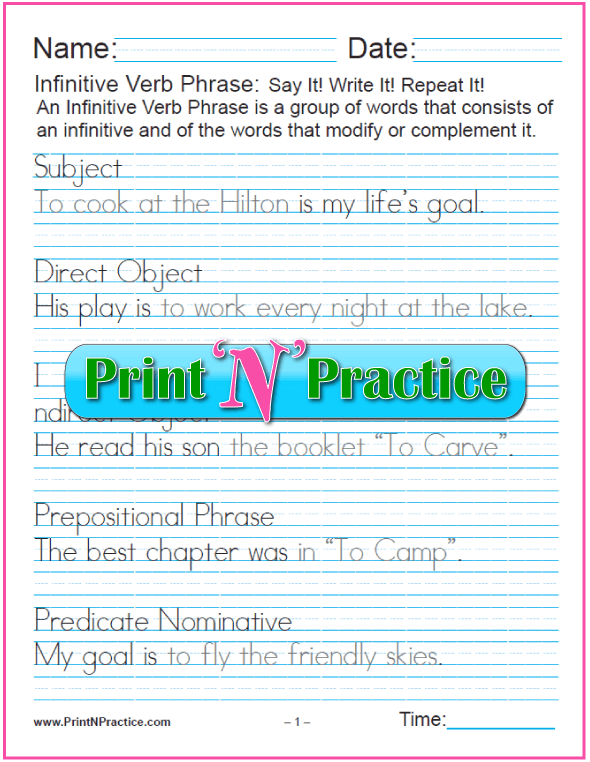 An infinitive phrase is a verb that is used as a noun and is often preceded by the word "to" which makes it an infinitive phrase. Other languages have this included in their base form of the infinitive. In English we use the two words: "to" plus a verb. An infinitive names an action or state of being. It is good to skate. The words to skate form the infinitive verb used as a noun and can be used in several parts of speech: subject, object, etc. Knowing the infinitive form of a word in English is very helpful when learning a second language, because many other languages use a suffix, or an ending, to indicate the infinitive verb as with French infinitives. It takes two words in English to form the infinitive: "to" + verb. 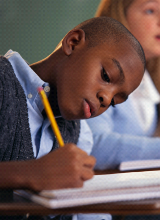 The infinitive verb for am/are/is/was/were is "to be". 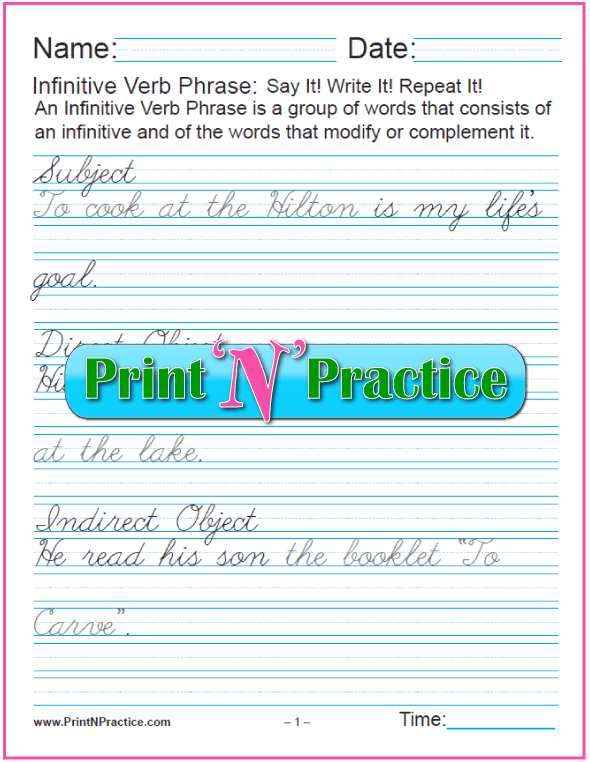 It is also called the full infinitive or the infinitive phrase. What is a split infinitive? 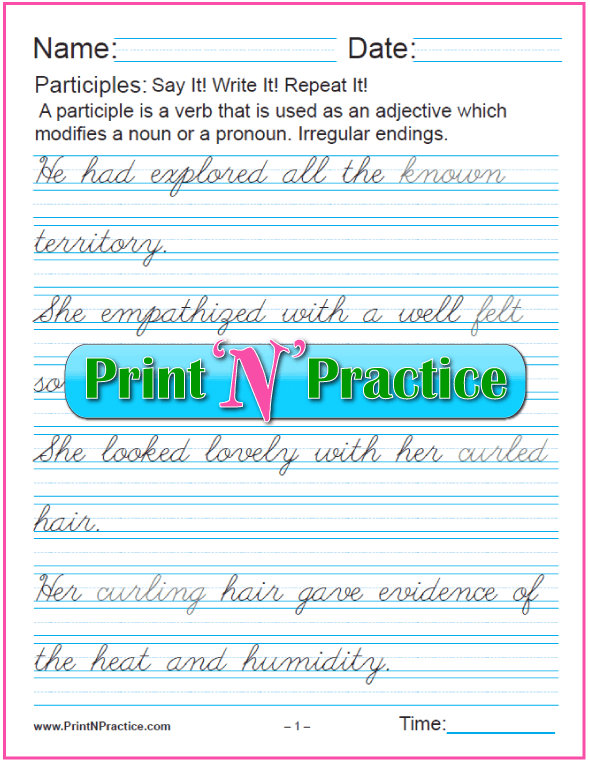 A split infinitive has an adverb in between the word "to" and the verb. 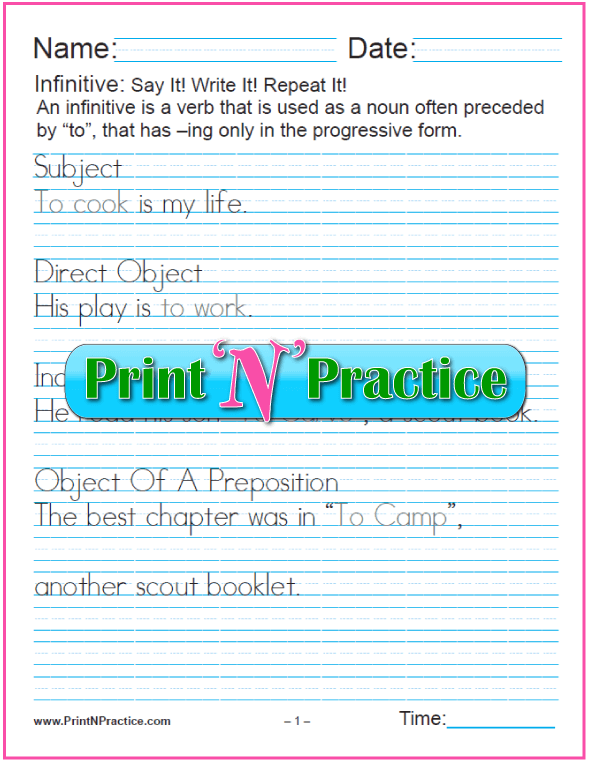 The infinitive phrase is "split" by the adverb or other word. 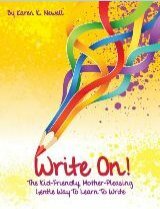 There is some controversy as it is thought by some that one should not split the infinitive. In some other languages this would be impossible because one could not insert the adverb into the word; yet because the English infinitive is in two words, it is possible to add an adverb. My opinion? I think that a split infinitive can add emphasis or be more descriptive. 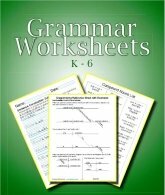 Thank you for visiting our participle, gerund and infinitive worksheets.